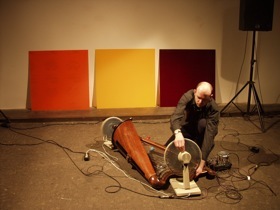 Rhodri Davies has been a significant figure in European experimental and improvised music for over ten years and is based in London. He uses a range of inventive techniques to extend the possibilities and sounds of the harp. His regular groups include Broken Consort, Q-02, Common Objects, Cranc, Portable, Apartment House, The Sealed Knot and a trio with David Toop and Lee Patterson. He has performed and recorded with diverse artists such as: Derek Bailey, B J Cole, Philip Corner, The BBC Symphony Orchestra, Luc Ferrari, Evan Parker, Christian Marclay, Sachiko M, Otomo Yoshihide and John Zorn. He also performs and researches contemporary music and is part-time lecturer at Huddersfield University. He has commissioned new works for the harp by: Carole Finer, Catherine Kontz, Michael Maierhof, Michael Parsons, Tim Parkinson, Mieko Shiomi, Yasunao Tone and John Lely.